As readers of this site have probably determined by now, there are a lot of things about the Christian faith that I cannot accept. I could probably spend the rest of my life going through both Old and New Testaments, picking apart the philosophy, the theology and the silliness of the stories that have drawn so many people into what I have determined to be a giant and enslaving cult. There is at least one verse in the Old Testament Book of Leviticus, one of the five books of law that comprise the Pentateuch or Torah, part of the holy books of the Jewish Bible that I am singling out for today's "Sunday sermon." First some background information. These five books in the Old Testament are attributed to Moses. But there are a couple of problems in just this attribution alone. The Book of Genesis, the first of the five, appears to have been passed down from several ancient writings that precede the time of Moses. The foundation for the Genesis stories can be found in the ancient clay tablets of the Mesopotamian empire, dating an estimated 6,000 years in the past. The last book in the Pentateuch, the Book of Deuteronomy magically tells of the death of Moses. Unless he could rise up from the grave like Jesus was alleged to have done, we seriously doubt if Moses could have written Deuteronomy either. Then the Book of Exodus begins with a story about a proclamation by the pharaoh of Egypt ordering Hebrew mothers to cast their baby boys into the Nile River. The second chapter records the birth of Moses and how his mother placed him on a raft in the bulrushes. There he is found by the daughter of the pharaoh, secretly raised by her servants and literally grew up under the pharaoh's nose. This is where we get the story of the miraculous rescue of Baby Moses that every Christian child hears in Sunday School. The question I must raise about this story should be easy for any Bible scholar to see. How could Moses know so much detail about his birth when he recorded such a detailed autobiography? If you examine this story you will see that Moses was secretly hidden on a raft in the bulrushes by an unnamed woman who conceived him with Levi. Then the daughter of the Pharaoh recovered the baby and secretly raised it as her own. With all of this secrecy, with possible punishment of death awaiting them if they were caught, there is little chance that a family story of Moses’ birth was passed down around the night fires. Next in the same book we find the story of Moses confessing to a murder, which led to his fleeing from the Pharaoh’s house into the wilds where he married Zipporah, the daughter of an Egyptian who took him in. Then while attending a flock of sheep in the hills Moses came upon the Burning Bush, which was allegedly God in disguise. There God gave him a plan for leading the Israelites out of Egypt. In other words, he had a speech impediment. This is an interesting point since later, when Moses came down from the mountain and delivered the laws imposed by God on the people, one of them, found in the Book of Leviticus, prohibited anyone with a physical imperfection from entering the temple or performing the holy rituals as a priest. 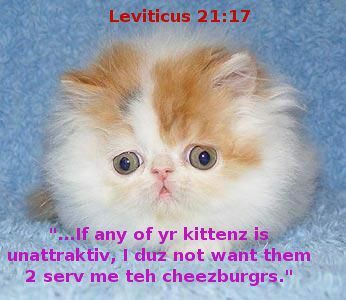 To be fair, those verses in the Book of Leviticus are directed to the priests who were chosen to minister to the nation of Israel. Yet in this day and age of concern about equality of all men and women, it seems that singling people out for the ministry by their personal appearance is not a very “Christian” thing to do. The preaching of God’s word then is assigned only to the “beautiful people,” only males, and no one else. If Moses wrote these words, how could he avoid the unfairness? For this law singled out Moses as being among the unfit to perform as a priest among the Israelites.